I know I say this every month but I really can't believe we're here again - December dreams. 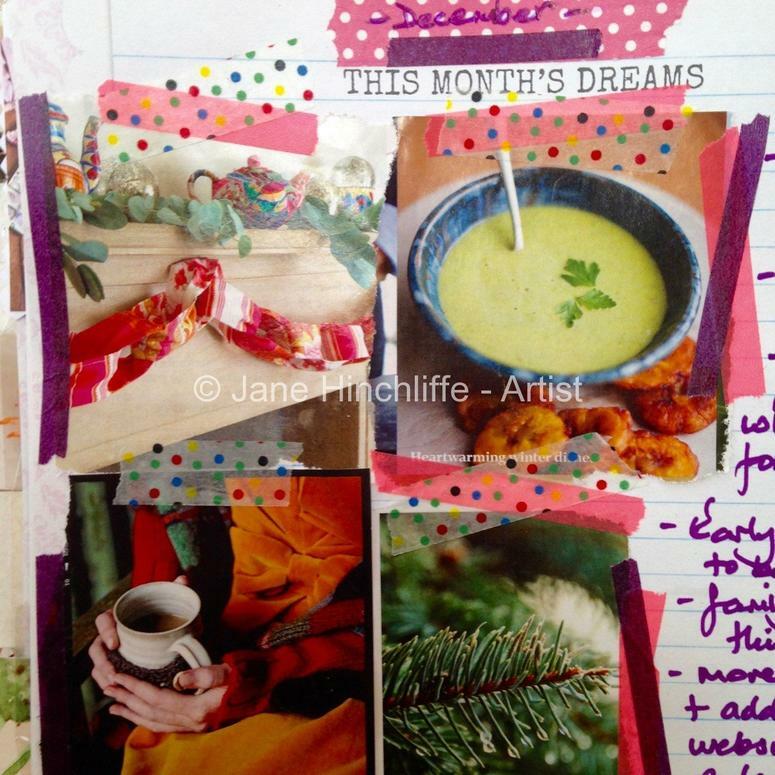 My December dreams and goals for this month are, (as you can see from my chosen magazine images) a lot to do with keeping warm, cosy, some tradition - ie. the Christmas tree pic (hopefully picking ours up on Monday), devouring a lot of comforting, yummy soup and festive decorating ie. the mantel piece pic and precious time with family over Advent and Christmas of course (yikes, our boys finish school two weeks today). I'm pacing myself for a local Artist in Residence day coming up on 12th Dec - lots of organizing of prints, cards and artwork for the day etc. Last month, I didn't manage to play in my sketchbook as much as I would have liked, so that's on the list this month. These days I'm finding going to bed a little earlier and having more time to read is also very comforting and feels so good. I'm taking note of Gretchin Ruben's Book Club Choices for December and as an aside, thought her post on What do you do with holiday cards? was interesting. So, over to you and what are your December dreams and goals? October and Autumn generally, are a time when I'm beginning to come around to the idea of spending more time indoors, eating more soup and other warm comforting foods, contemplating a sewing or knitting project and generally letting go of some stuff (rather like the falling leaves from the trees I'm watching drift onto the lawn in our garden). I also want to slow the build-up to Christmas down a little this year, so I'm planning on spending some time looking how this might be possible. In the meantime, I do hope you find some time to jot down what's important for you this month in whatever way feels helpful and true to you. Remember, by clarifying your dreams and goals, you are actually focusing your energy and resources in order to accomplish something that is important to you.